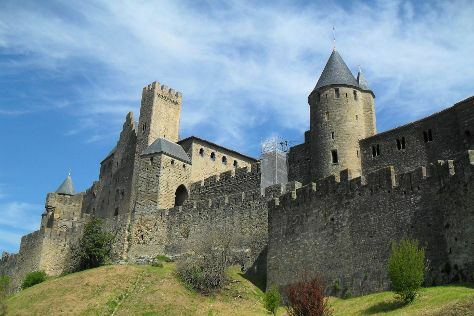 Kids will enjoy Carcassonne Medieval City and Cite de l'Espace. Explore the numerous day-trip ideas around Toulouse: Carcassonne (Basilica of Saint-Nazaire, Chapelle des Dominicaines, & more) and Albi (Sainte-Cecile Cathedral of Albi & Musee Toulouse-Lautrec). The adventure continues: take in the spiritual surroundings of Basilique Saint-Sernin, test your problem-solving skills at popular escape rooms, and contemplate the long history of Church of Les Jacobins. For more things to do, other places to visit, and other tourist information, refer to the Toulouse tour planner. If you are flying in from Hong Kong, the closest major airports are Toulouse-Blagnac Airport, Carcassonne Airport and Tarbes-Lourdes-Pyrénées Airport. In September, plan for daily highs up to 28°C, and evening lows to 16°C. Finish up your sightseeing early on the 13th (Wed) so you can catch the train to Bordeaux. Attractions like La Palmyre Zoo and Réserve Ornithologique du Teich make great kid-friendly stops. Venture out of the city with trips to Château de Reignac (in Saint-Loubes) and Dune du Pilat (in La Teste-de-Buch). Dedicate the 17th (Sun) to wine at some of the top wineries in the area. Next up on the itinerary: don't miss a visit to Place de la Bourse (Place Royale) and learn about winemaking at Rendez vous au chateau. To find reviews, other places to visit, traveler tips, and other tourist information, you can read our Bordeaux trip planner. You can take a train from Toulouse to Bordeaux in 2.5 hours. Alternatively, you can drive; or take a bus. Expect a daytime high around 28°C in September, and nighttime lows around 15°C. Finish your sightseeing early on the 18th (Mon) to allow enough time to travel back home.